The cystic fibrosis transmembrane conductance regulator (CFTR) is a 1480 amino acid membrane bound glycoprotein with a molecular mass of 170,000. It is a member of the ATP binding cassette (ABC)superfamily of proteins. The protein is comprised of two, six span membrane bound regions each connected to a nuclear binding factor which binds ATP. Between these two units is an R-domain which is comprised of many charged amino acids. The R-domain is a unique feature of CFTR within the ABC superfamily. Put your mouse over the domain region in the following graph to view the summary of that domain, click to view the details. 19 % of the CFTR protein make up the twelve transmembrane domains (M1 - M12). These domains have been shown to be comprised of typical a-helical secondary structure. Many of the residues within these regions form the channel lining residues and have a major role in the regulation of pore function. 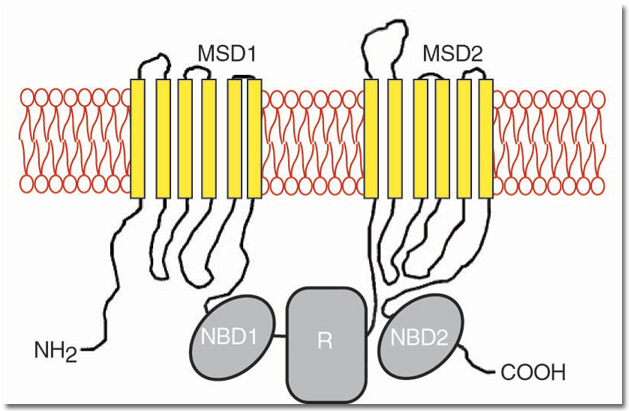 Six positively charged residues within the transmembrane domains [K95 (M1), R134 (M2), R334 (M6), K335 (M6), R347 (M6) and R1030 (M10] that are well conserved across species. Two of these are associated with mutations causing CF, R334Q/W and R347C/H/L/P.